SATSANG UPDATE: 14 April 2019(Sunday) - Satsang at Hansi Ashram, Hansi-Bhiwani Road, Haryana at 10 AM. 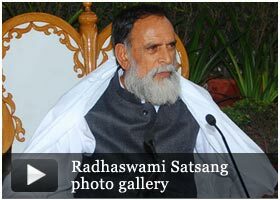 NEW WHATSAPP/SMS SERVICE: Send "JOIN RADHASWAMI" to "08285616199" to get Satsang Program updates on your mobile phone. Radhaswami Satsang Dinod (Bhiwani) was established by Param Sant Tara Chand Ji Maharaj in the last decades of twentieth century. Huzur Tara Chand ji was born in the house of Ch. Moola Ram ji in Dinod (Bhiwani) in 1925. 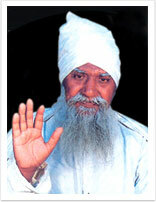 Huzur Maharaj ji's life was full of struggles, because he spent his life in search of God. He remained unmarried and lived a hard life to find the truth. He went to Agra, Beas and Sirsa and saw the famous places of the Radha Swami Faith. Like Budha and Mahavir Swami, he declared that he got eternal peace in his life time. Like his other predecerssors of the Radhaswami Faith he also told the people that eternal peace can be got in human life and the Radha Swami Faith is the easiest way to get the Peace. Click on the link below for Satguru kripa..
Click on the map or the link below to see the map. 14 April 2019(Sunday) - Satsang at Hansi Ashram, Hansi-Bhiwani Road, Haryana at 10 AM. Radha Swami Dinod Village Dinod Dham, Distt. Bhiwani Haryana (INDIA). All rights reserved.